Source: Thanks so much to Second Story Press for providing me with an e-ARC of this book via Netgalley! I requested On the Spectrum with very high hopes. What drew me to request it was a) the fact that it took place in Paris, and b) the fact that one of its main characters had high-functioning autism, which some of my loved ones have. I was ultimately curious about its representation in this story, so I decided that I must dive in! For a brief synopsis of the novel, it revolves around Clara, who is obsessed with eating healthily. She refuses to take a bite out of anything unhealthy, and she sticks with what she knows. This summer, she decides to go to Paris to stay with her dad and brother, Alastair. Alastair has an autism spectrum disorder, but in spite of that, the two set off together to explore the beautiful city of love. The main character, Clara, was such a sweetheart! I felt so sorry for her regarding her circumstances at home and her eating disorder, but I feel like the whole experience with her family in Paris changed her for the better, making her a much stronger, more confident girl. The positive outlook on life that she gained was very evident while reading- it felt REAL, and I was very happy about that. Despite the synopsis covering up any trace of romance in this book, there was still quite a bit of it between Clara and a swoon-worthy guy named Michel who, if I’m not mistaken, works at a bakery. Honestly, it was adorable, though uncalled for. This book could still have been amazing without the romance, but that’s just my opinion. As for the high-functioning autism representation, I felt like it was a tiny bit overdone and exaggerated, if you get what I mean. I’m not saying it was bad, but it just wasn’t perfect. I know that every person on the spectrum functions a bit differently, but Alastair was given almost all of the traits that fall under it. I just found it unrealistic, is all. Also, unfortunately, I can’t really talk about the representation of the eating disorder that Clara had because I know nothing about it, but I’m guessing that it didn’t seem too bad. One last thing I loved about On the Spectrum was its family ties. Clara’s budding relationship with Alastair was simply beautiful to watch, and Alastair was just so adorable! I also adored how Clara was able to re-bond with her father! 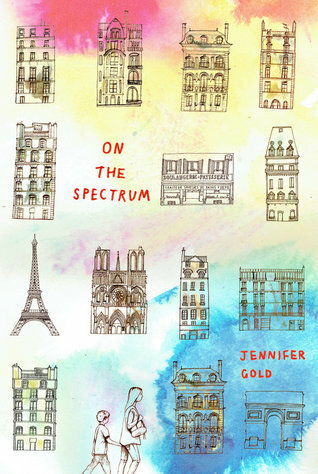 Overall, if you’re looking for a contemporary with a little bit of sparkle from everything, On the Spectrum is the book for you. Its characters were great, the plot was fast-paced, the romance and the family ties were amazing, and it was diverse. What more could you ask for?